Originating from a pure agricultural land, Prof. Dr. Nguyen Thi Lan, president of Vietnam National University of Agriculture (VNUA), who is member of XIV National Assembly, current chairwoman of Asian Veterinary Association, has been devoted her passion to plants, crops, animals and had a great contribution to the development of the country. Prof. Dr. Nguyen Thi Lan was born in Thach That district, a pure agricultural district of Hanoi. When she was still small, Prof. Lan was exposed and close to rural and agriculture activities with trees, crops, and animals. Her passion and the love to agriculture is growing by time, becoming a partial contribution to her successes. Graduating from high school in 1990 when many of her peers were wondering which universities should apply to, Lan determined to register in Veterinary Medicine at the University of Agriculture No I (former name of VNUA), with a simple wish of becoming a veterinarian to cure for animals and poultry. During the time at university, she received full of mentorship from teachers inspiring her and nurturing the love and passion to the veterinary profession. In 1995, Mrs. Lan graduated from the University of Agriculture No I, then she was recruited to work as lecturer at the faculty of Veterinary Medicine. Right from the early days of teaching, the young teacher Nguyen Thi Lan was aware of the importance of research and the linking of research with practice. In the context of limited laboratory equipment, she had to explore and improve her knowledge by herself, exchanged with colleagues to innovate teaching methods. Ms. Lan shared that: “At that time, I keep in mind that I should strive to improve my capacity and knowledge, and also inspire my students so that I could work well as my teachers, who helped me before, expect”. After 7 years of working, thanks to efforts and continuous learning, Lan was granted a fellowship by the Japanese Government to pursue her post graduate at University of Miyazzaki, Japan. Returning home in 2007, bringing with her ambition of doing more research in order to apply them into the practice, sharing knowledge accumulated in Japan, Dr. Nguyen Thi Lan eagerly rushed to work. But at that time, she faced difficulties for example lacking of research equipment and limited budget. In 2008, the blue ear pig disease broke out widely in the country, posing challenges for researchers to find ways to prevent and treat diseases. She quickly proposed a research on technology for manufacturing rapid diagnosis of respiratory and reproductive disorders syndrome (PRRS) which was approved as a state-level Project in 2009. After 2 years of implementation, the research team led by her collected 986 samples of blue ear disease, selected the cell line Marc-145 to isolate 20 strains of blue ear virus, of which 6 strains reached the titre high, stable biological characteristics and genetic properties as materials to produce diagnostic kits and other intensive research on pig ear disease. The diagnostic kits have been used in several provinces such as Bac Ninh, Hai Phong, Thai Binh and Hai Duong with good results. At the same time, the technology of manufacturing diagnostic kits has also transferred to enterprises for pilot production and commercializing products. Up to now, Prof. Dr. Nguyen Thi Lan has been involving 22 scientific and technological projects at all levels, published 105 academic papers in prestigious journals at home and abroad. Many products from projects led by Prof. Lan have been nationally recognized and transferred such as "Monoclonal antibody for diagnosing Care disease in dogs", "Vaccine for Care disease prevention in dogs", "Microorganism products used in animal husbandry"
In the process of working, especially from the time of working as Vice Dean of the Veterinary Medicine Faculty and Head of the faculty laboratory (2012-2015), to now, being as president of VNUA (from 2015), she always sets up target strategy that "Research is the vitality of the university". Despite undertaking various tasks, Prof. Dr. Nguyen Thi Lan still spends her time with her students to timely encourage and provide appropriate consultancy and orientation to them. She excitedly said: "every year, I directly mentor some groups of students to do research. Working with them, I feel very excited. They often have interesting ideas and initiatives. Seven groups of students mentored by her won Vietnam Fund for Supporting Technological Creations (VIFOTEC). 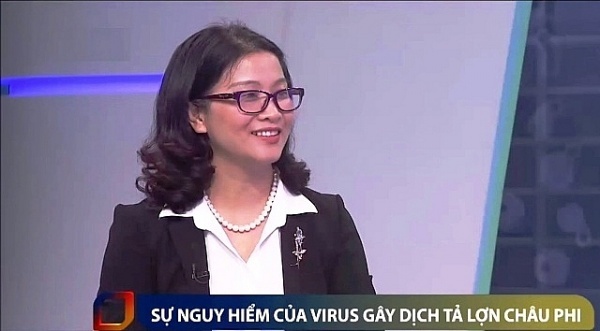 As a member of the XIV National Assembly, a member of the Hanoi City delegation, a member of the National Assembly's Committee for Science, Technology and Environment, she has been working actively to propose ideas and recommendations for amendments of the laws in education, animal husbandry, crop production, technology transfer so that these laws can act well with the reality. At the age of 45, Prof. Dr. Nguyen Thi Lan has become the youngest professor in the history of VNUA and also the Veterinary Medicine field. She receives the Honorary Professor of Yamaguchi University (Japan), visiting professor of University of Miyazaki (Japan) and recently she has become the youngest woman to receive the Kovalevskaia Award, a notable award for outstanding female scientists in Vietnam. “I am fortunate to have the sympathy and sharing from my family, relatives, friends, colleagues and people around me. It is an encouragement and inspiration for me to work hard and try my best in life” said Prof. Dr. Nguyen Thi Lan.